With another F1 Season over it's an apt time to salute those who will no longer be racing with us in the future. I'm not talking about anybody dying just those who let's just say "haven't met the standards" and who are now being quietly asked to leave. This week the fickle spotlight of F1 stardom focuses on the unloved Virgin; Luca Di Grassi. The now former Virgin F1 driver has been replaced by Jerome D’Ambrosio and even the sub bench that is the test driver role has been taken by unknown quantity Luiz Razia. So what now for Di Grassi? It's sad to think how excited he must have been when Virgin F1 gave him the call last January to say he had reached the pinnacle of motorsport. He had an impressive few seasons in GP2 and tested for Honda and Renault before joining Virgin F1. In January 2010 at the initial tests at Silverstone he said excitedly "I'm really happy and our first impressions of the car are very positive". 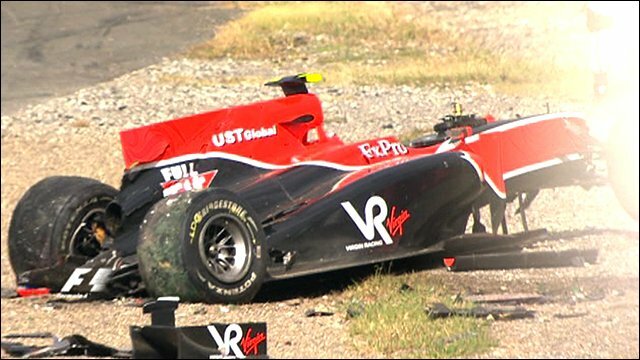 His best result of the season was 14th in Malaysia but he crashed before the Japanese GP on his way to the grid (main pic). Would he have thought that when he finished 18th at the last race of the season in Abu Dhabi that it would be the last time he would race an F1 car? After the race he said in desperation "I am ending the year with a feeling of ‘mission accomplished’ - I did the best I could with what I had and only one or two mistakes during the whole season, so I feel that the effort and quality of my work have been much better than is reflected in the raw results". Now, instead of a new contract he has got one of those abhorrent corporate blurbs from the team; “Finally, I must thank Lucas Di Grassi for the important role that he also played in establishing the team. He contributed a great deal to our development and we wish him every success in his future career, which we have no doubt will be an exciting one.” Oh what tosh! Poor Di Grassi; maybe he'll get a last minute seat with another team although frankly Virgin F1 was already pretty much bottom of the pile so options are limited. Like the ghosts of oh so many drivers through the years it looks like Di Grassi's is just the very latest. In one interview he was asked how would like to be remembered as an F1 driver. He replied "As the guy who was completely focused and who did everything he could to have the best performance he possibly could". Hmm. sadly I doubt we'll remember him at all, good bye Luca, best of luck. Great informative site. I'm really impressed after reading this blog post. I really appreciate the essay writer time and effort you spend to share this with us! I do hope to read more updates from you.%%@@!! You have nice talk about the spring cleaning. I liked you blog. This is really wonderful. Please keep me more update form your blog.